Are you interested in botanical art? The Society of Botanical Artists of the Netherlands is showing work in the exhibition “Bulb flowers’ at museum de zwarte tulp in Lisse. Hotel Restaurant & Casino De Nachtegaal is situated at the edge of the town of Lisse along the major N208 road. Across the hotel you can see the flower fields and the windmill of Keukenhof. 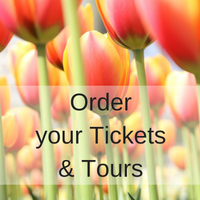 It is a 15 min walk to Keukenhof or you can take the bus at the roundabout in front of the hotel. Bed and Breakfast De Zonnehoed is situated at the edge of the town of Lisse (2km) towards the town of Sassenheim (4 km). Bed and Breakfast Madeleine is situated in the town center of Lisse, above one my favorite confectionery / Chocolaterie shop “Vermeer”! (Make sure you taste their delicious cakes and pastries!). They have two new completely renovated twin rooms in a warm and romantic ambiance. One of my favorite restaurants in Lisse has opened a four room Bed and Breakfast. De Vier Seizoenen (Four seasons) is situated in the town center of Lisse on 1,5 km from Keukenhof, just a 10 min. walk. Shops and restaurants can be found in the surrounding streets.